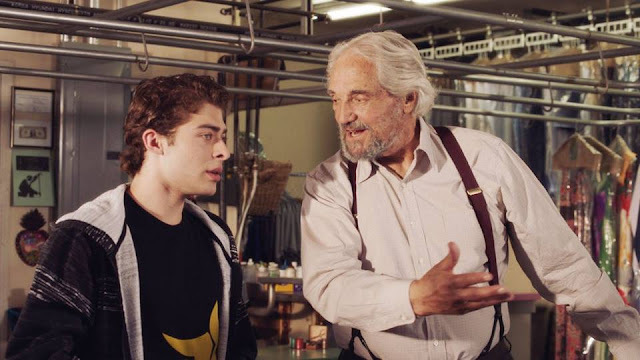 Release Date: May 30, 2014 – U.S.
"Chef" is a film about relationships. A cook's relationship with his food. A chef's relationship with his staff. A father's relationship with his son. Chef Carl Casper (Jon Favreau) controls the kitchen of a major Los Angeles restaurant, but he's not the owner – that distinction belongs to Riva (Dustin Hoffman), who's more concerned about what's in the cash register than on the plate. Despite those difficulties, Casper has a great staff: his sous chef, Tony (Bobby Cannavale); his line cook, Martin (John Leguizamo); and his hostess, Molly (Scarlett Johansson). They're all fiercely loyal to him. They love him. So does his ex-wife, Inez (Sofía Vergara), and their 10-year-old son, Percy (Emjay Anthony). A prominent food blogger, Ramsey Michel (Oliver Platt), is coming to the restaurant to review Casper's cooking. The chef wants to create a new, bold menu that will wow the critic's culinary senses. The owner disagrees. Keep everything the same, he says. "Play your hits!" Unfortunately, the chef's "hits" make him a tired nostalgia act instead of the vibrant visionary he used to be. As Casper's boring molten lava cake bubbles over, so does his anger. A shouting match between him and the restaurant reviewer quickly becomes an internet phenomenon, and a mistaken public message on Twitter ignites a war of words. Food is Casper's calling. If he gets a bit hot-tempered sometimes, it's because he cares so much about what he cooks. Like any artist, he's passionate. But now he's also jobless – and there are no offers in sight. Left with no other options, he reluctantly accepts his ex-wife's invitation to join her and their little boy in Miami for a week. It would be good for him, she reasons, to get away for a while and spend time with his son. Miami is where it all began for him: his culinary career, his relationship with her, and the birth of their child. Inez urges Carl to consider opening a food truck. That leads to a meeting between him and her first ex-husband, a rich flake named Marvin (a scene-stealing Robert Downey Jr.). The off-kilter conversation between Favreau's chef and Downey's crazed character is one of the best and funniest moments in the film. Downey's presence amounts to little more than a cameo, but he makes every single second count. Truly, all of the actors are fantastic. Favreau and Leguizamo share such an easy, natural rapport that it feels like you're genuinely listening in on two old friends. The same can be said for the love and pride Favreau's character feels for his boy; it just bursts through the screen. If I didn't know better, I'd think they were really father and son. Some of the best moments between them are the quiet ones – such as little Percy explaining to his dad how Twitter works, the concept of Vine's six-second videos, and what it means when a post "goes viral." Favreau is awesome as a 40-something-year-old who is behind the times technologically, and Emjay Anthony is heartwarming as the kid who just wants to spend time with his father "like they used to." 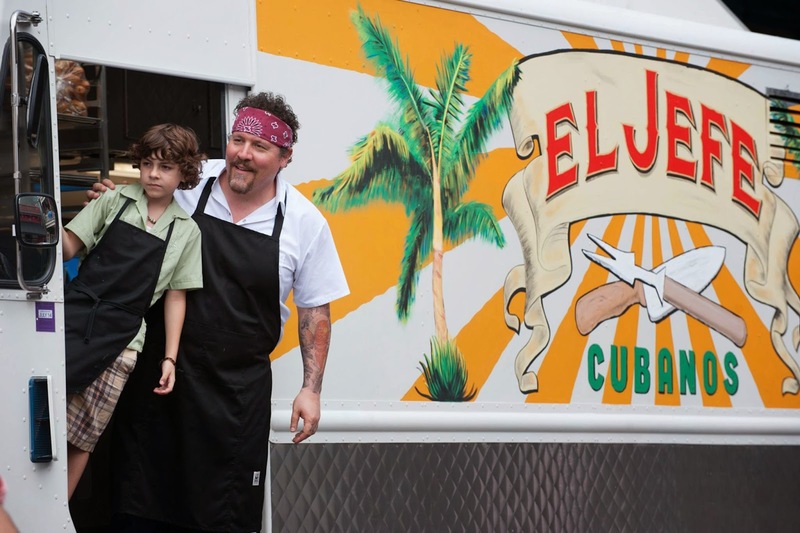 Once the food truck becomes operational, "Chef" turns into one of my favorite of all the genres: the road trip movie. This is where the film really shines. There on the open road, they talk, bond, take in the great sights (and smells), and discover new things about themselves and each other. And then, of course, there's the food itself. Mmm Mmm! You will walk out of the theater wanting a second dinner. "Chef" is not only a film about relationships, it's also about love. It was obviously a labor of love for Jon Favreau. In addition to being the star, he is also the writer and director. This is clearly a passion project for him – and it shows. He's taken all of the ingredients at his disposal and served us one of the year's best films. Note: In "Chef," @ChefCarlCasper started a vicious "Tweet war" with @RamseyMichel that went viral. For a more pleasant and peaceful experience, you can follow me on Twitter @ScreenSurprises. "Oh my God, I have been smiling about that movie since we saw it. What a great experience. Thanks for getting me out of my draining work rut to see it. It was so worth it! Maybe sitting still is going to help me get where I need/want to be. It IS moving forward, but just not in a direction I have ever gone in…"
"Chef," she said, was "life changing" for her. It's an easy movie to love. One cannot help but feel an infectious enthusiasm for it.